Not excited about Far Cry 4 already? Ubisoft hopes to change that with their latest cinematic trailer for the game, starring its bleached-haired villain Pagan Min. The broken statue represents the fall of Kyrat’s leadership. The purple suit represents bein’ a boss. 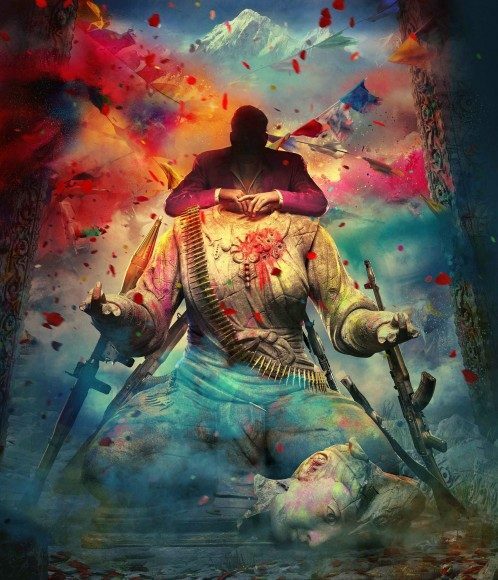 There are few games that have fully embraced the concept of the psychotic militant dictator quite as much as the Far Cry series. With the fourth game in the series, however, the team are changing things up a bit. How? By giving him a purple suit. Naturally there is more to Pagan Min than just his sense of style. Unfortunately, seeing what is there is reserved for either those who serve some purpose, or who will never live to share their insights. Some times, both. Some quality time with the dandy dictator was not the only item on the agenda for Ubisoft this week. In addition, the company has also announced a partnership with Sony to bring special Far Cry 4 bundles of the Playstation 3 and Playstation 4 to market. These will be available at Far Cry 4’s launch on November 18th, at least if you are lucky enough to live in Europe; as of yet, no confirmation of American releases of these bundles have been made. This comes closely on the heels of their announcement that the PlayStation version would also include an exclusive limited sharing feature of the game’s multiplayer, giving the Sony releases for the game a bit more love so far than the Xbox or PC versions. The Far Cry series as a whole is seen as one of the better open-world FPSes on the market, and many fans are holding out hope that Far Cry 4 will live up to its predecessors, and its own hype, and deliver a unique experience on all the platforms it is coming to. If nothing else, Ubisoft definitely feel they have a strong villain in Pagan Min. So far, it looks like they’re right.